The magnificent Egyptian resort Sharm El Sheikh was closed to tourists for a whole week. Instead, it was flooded with Egyptian policemen and other law enforcement agencies as well as hundreds of security personnel from Europe. What was going on? It turns out that the first ever EU-Arab League Summit was held, without much fanfare, in this resort town, where it “died” equally quietly. Once the meeting finished, reactions from the highest levels were scarce and fairly pessimistic in nature. “Democratic” European newspapers, accustomed to pulling no punches, called this spectacle “insignificant and ceremonial”. And yet, so many hopes and plans were associated with this Summit, which some Arab newspapers called pivotal and decisive for the Arab world. Perhaps the spokesman for Arab League Secretary General, Mahmoud Afifi, gave the most just and accurate assessment of this event by saying that Europe has gained a “new understanding” of the Middle East. Incidentally, the next summit will take place in Brussels in 2022, and beforehand the parties will most likely continue making sense of this “new understanding”. Naturally, the Summit bore witness to the same old tired demagoguery and meaningless statements from both sides. The President of the European Commission, Jean-Claude Juncker, pompously stated: “The summit itself is a message to the rest of the world”. Having stressed the importance of working with European nations en route to resolving regional conflicts, the President of Egypt and the host of the Summit, Abdel Fattah El Sisi, musingly stated that the Middle East needed to transform from a conflict zone into a prosperous region. But these are nothing but dreams! While discussing security and economic cooperation between Europe and the Arab world, the High Representative of the European Union for Foreign Affairs and Security Policy, Federica Mogherini, fairly honestly remarked that the predominantly young Arab population needed jobs and future opportunities, otherwise, she warned, “we risk even greater tensions and suffering for our people.” And this is indeed true, as soon, Europe will be flooded with a new generation of refugees from various Arab nations. The speech, given by the Saudi King Salman bin Abdulaziz Al Saud at the Summit, in general, generated bewilderment, laughter and discussions among its participants. The elderly man hesitantly and with great difficulty read a text prepared beforehand. Its message was essentially as follows: “We reaffirm our firm position towards the restoration of all the legitimate rights of the Palestinian people, foremost of which is the establishment of an independent Palestinian state on the 1937 borders with East Jerusalem as its capital.” We can just imagine how skilled these Saudi “expert diplomats” are if they do not even know the Palestinian issues at stake. After all, it is common knowledge that in 1937, the Peel Commission prepared a report concluding it was impossible to resolve the conflict, which arose between Arabs and Jews, using the one-state solution, and the Palestinian territory had to be partitioned in two. According to this plan, most of the territory was to go to the Jewish state, while Palestine was to receive Negev, the area around Gaza and the lands on the West bank of the river Jordan. In order to smooth over the resulting confusion, the King, on his return home, was “asked” to read an updated and corrected text regarding Palestine. Still, one positive development did stem from this infamous Summit. European representatives responded in a fairly cool manner to timid attempts, made by several Arabs, to offer them aid in establishing the Arab NATO or another alliance with the European NATO. Western media outlets were quite direct in expressing viewpoints of their leadership, and stated that there was only one NATO, the European one, with no need for another organization especially an Arab one. In addition, Europeans are always ready to “stick a pitchfork” into the side of the U.S. President Donald Trump, who has lost all sense of moderation, and they invariably do so with great pleasure. It is well known that Washington, and first and foremost Donald Trump, persevere in their efforts to establish a military alliance, modeled after NATO, in the Middle East. Its main aims are to defend U.S. positions in the region after reduction in American military personnel stationed there and to increase pressure on Iran. For instance, the former top spy Mike Pompeo, who has risen through the ranks to become the current Secretary of State, went on an extensive tour of these nations. The official reason for these visits was the need “to clarify the US position” on withdrawal of troops from Syria to its allies and to handle issues connected with the military alliance. Donald Trump fully understands that the nations in the Arab League and the entire Arab world are in Riyadh’s debt trap. He, therefore, applied great pressure on Saudi Arabia while, at the same time, scaring it with mythical threats. From Donald Trump’s point of view, the United States has, for far too long, paid to protect its allies in the Middle East, and the time has come for these nations to defend themselves. “We protect Saudi Arabia. Would you say they’re rich? And I love the king, King Salman. But I said ‘King – we’re protecting you – You might not be there for two weeks without us – you have to pay for your military’,” bluntly stated Donald Trump. However, the U.S. President does not know the history of Arab nations and does not understand their mentality. 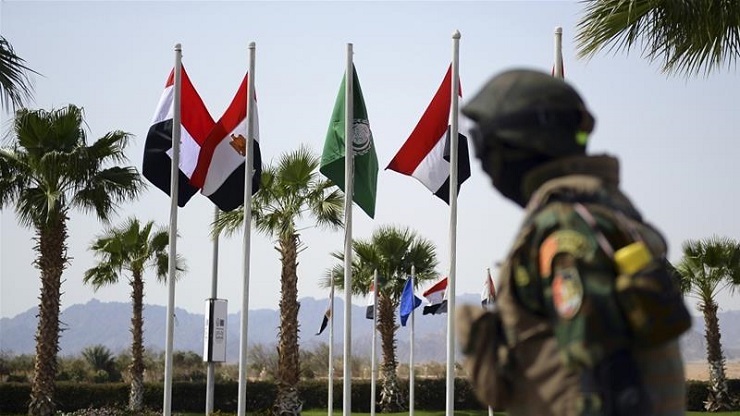 For instance, the Cooperation Council for the Arab States of the Gulf (GCC), which comprises Saudi Arabia, Kuwait, Qatar, Bahrain, the UAE, and Oman, was founded dozens of years ago, but it is yet to establish a joint military force. For example, when the Pearl revolution took place in Bahrain, only armed forces from Saudi Arabia and the UAE were deployed to the islands and “killed” hopes for a better life of the Shiites (the majority of Bahrain’s population) living there. Even now, Saudi law enforcement agents are continuing to teach these “lazy” Shiites a lesson, because they are still protesting against the hegemony of the Sunni population, which, at best, accounts for 20% of the population. Concluding the military alliance among Arab nations is further complicated by the barbaric murder of the Saudi journalist Jamal Khashoggi, and the fact that the Crown Prince of Saudi Arabia, Mohammad Bin Salman Al Saud, has been accused of orchestrating this assassination. And even if Donald Trump himself does not wish to create an uproar about this “minor” issue, on investigating this crime, the U.S. Congress openly accused the Crown Prince, Saudi Arabia’s current ruler and possibly future King, of issuing the order to kill the journalist. The Congress also demanded that all the culprits responsible for this notorious crime be removed from their current posts. At the same time, it is understandable that this military alliance, “in the works”, is to the benefit of Tel Aviv, as then another influential opponent to Iran will appear in the region. The Arab NATO may become the means of containing the spread of radical Islam and terrorism, which will also have a positive effect on security of Israel. On the other hand, this Arab military alliance may instead become a threat to Israel on account of the widespread anti-Israeli feelings in the region. After all, only recently Israelis were forced to engage in bloody wars against Arab armies. If a Middle Eastern strategic alliance is established, it will substantially change the security landscape in the region. But will such adjustments be positive? The Arab NATO will cause the already hostile relations between Iran and the United States to worsen, and establishing a missile defense system in the region may lead to retaliatory measures from the Islamic Republic of Iran. “Under the pretext of securing stability in the Middle East, Americans and their regional allies are fomenting tension in the region. The approach would have no result beyond deepening the gaps between Iran, its regional allies and the US-backed Arab countries,” reported the influential newspaper Tehran Times. If we were to tally all the efforts made by the West, be it Europe or the United States, in relation to the Arab world, we could say that all these plans are permeated with the desire for personal gain. And the West can easily reap the benefits which is what it does. Tehran Times comments on the Summit in Egypt said that it was probably a waste of money and effort for Egypt to host this event, which once again proved that the West and the United States were not friends, but enemies to the Arab world. Victor Mikhin, a member of RANS, exclusively for the online magazine “New Eastern Outlook”.